I doubt I'm the only person who nearly went out of their minds with excitement over the fact that Hugh Jackman is going on a Broadway tour with a new show, even if it's happening in Australia and I sadly don't have a house there. But the first thing that leaped into my brain was, "Who does this guy think he is, Taylor Swift or something?" Which sounds like a really ridiculous thought right off the bat, but, the more time I spent with it, the more I started to get behind it. Because, guys, Hugh Jackman really is the adult, male version of Taylor Swift. At 46 years old, Jackman is more or less twice Swift's age, but the two actually have a ton in common, from their personalities to their reputations to their careers. They move in different circles, obviously — because how would they have met each other? — but each has a ton that he or she could learn from the other. If Swift is smart, which we know she is, and reads my posts, which is unlikely but honestly possible with all the Taylurking she does around the Internet, then I wouldn't be surprised to see that Jackman is the next guest she has come strutting down the catwalk at one of her 1989 World Tour concerts. His attitude fits in perfectly with the positive, empowering celebrities she usually invites to join her onstage, and, if he showed up next to her, it would be all the proof I needed that these two really are two peas in a pod. Other than these nine reasons I already came up with, of course. Like I said, this was the announcement that started it all. Jackman will be going on the road with a new stage show loosely based on his own life called Broadway to Oz later this year. It will have performances in five Australian cities through November and December, and will cover everything from Jackman's early life growing up in Australia and getting involved with the stage to his current success. It's no sold-out, Swiftian world tour, but everybody's gotta start somewhere, right? Did I mention that Jackman's show has a cast of 150 musicians and dancers? Now we're talking Taylor Swift's language. 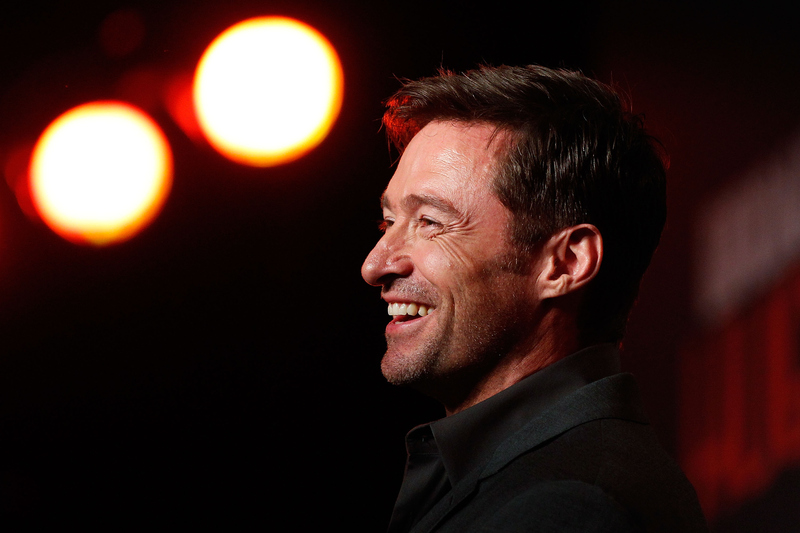 Just like Swift, anyone who has crossed Hugh Jackman's path has nothing but gushing compliments for him. Every time he does a movie he picks up another best friend, like Anne Hathaway in Les Miserables . Sounds pretty familiar, right? I've never seen either of them truly fail at something, probably because they're both so fearless and such hard workers that it doesn't even register to them as a possibility. In the same way that we try to romantically link Taylor Swift with every boy she raises an eyebrow at, Jackman has been enduring speculation about his private life for pretty much his whole career. Even though Jackman wed his wife Deborra-Lee Furness in 1996 and has been happily and effusively married to her ever since, one of our favorite national pastimes seems to be wondering if she's a beard and Jackman is actually gay. Charming. Just like Swift, Jackman is passionate about fitness, and it shows. Swift had some struggles along the way where she spoke ill of... ahem... a few ex-boyfriends, but she seems to have found a place now where she works those issues out with the people involved instead of putting them on blast in her songs and interviews. That seems to be a lesson Jackman has learned as well, because I've never heard him have a negative word to say about anybody. Taylor Swift is officially the most charitable celebrity out there, but Jackman is way up there too as far as giving back, throwing his support behind Equity Fights AIDS, the Global Poverty Project, World Vision, and Australia's Bone Marrow Institute, among many, many others. Jackman already has an Emmy for his work hosting the 2004 Tonys, and two Tony Awards, so all he needs are an Oscar and a Grammy, which I feel are totally doable. And, on the other side, Swift obviously already has a bunch of Grammys, so the "G" is covered, and I have no doubt she can get any other award she sets her mind to.